Here is a typical measurement of an inward current in a cardiac cell, in this case, a calcium currrent. The top panel illustrates the voltage clamp potential - alternating between a rest potential of -80 mV and a test potential of 0 mV. With each stimulus, calcium channels open and calcium ions flow into the cell - as shown in panel B. However, in the presence of a channel blocking agent, something interesting happens. With successive pulses, the peak inward current is reduced - as if the more you "use" the channels, the larger the fraction of blocked channels. This is the origin of the term "use-dependent". Panel C illustrates what we think is happening. Instead of the binding site being continuously accessible as with many other receptors (e.g. beta adrenergic, seratonin, alpha adrenergic, ACh ) many ion channel binding sites appear to be sensitive to channel conformation, with periodic activation, it appears that the binding site is only transiently accessible. Stated another way, during the rest phase of stimulation, the receptor binding site is "guarded" and inaccessible. However, during the excitation phase of the stimulation, the receptor binding becomes accessible so that binding is possible. Thus, during excitation, there is an exponential incorporation of drug by channels but during the rest phase, drug is free to escape (with an exponential time course) from the binding site (untrapped) or cannot escape (trapped). Because this process differs from the type of binding seen in typical ligand-receptor systems (e.g. beta receptors), it has been unsuitable to traditional analysis, i.e. using equilibrium dose-response curves to estimate the Kd. Why is modeling channel blockade interesting? There is considerable clinical evidence that a large class of antiarrhythmics are proarrhythmic. In addition drug overdose victims often appear with ventricular tachyarrhythmias - and many abused substances are use-dependent Na channel blockers. Some recent progress with understanding the proarrhythmic properties - as it relates to the cardiac vulnerable period is available by clicking here . There is also a new (2001) manuscript describing how antiarrhythmic drugs can increase the rate of sudden cardiac death This paper is basically a physics paper - taking the mechanisms behind wave formation and ion channel blockade and demonstrating how slowly unbinding Na channel blockers can increase the region of vulnerablility in cardiac tissue. Look at this for ideas and insights into the proarrhythmic potential of antiarrhythmic drugs . It all started in Joe Greenfields office in late 1980. Joe had just become chief of cardiology (at Duke) and was in the process of interviewing everyone in the division. During my interview, Joe correctly noted that I was not having "fun" with the Cardiology Database that Bob Rosati and I had started 12 years earlier - and that perhaps I might help Gus Grant and Harold Strauss with some cardiac pharmacology problems. In Joe's words, Harold was threatening to go to NC State to study math- which would be a disaster - so why couldn't I join up and see what I could do to help. A quick meeting with Gus and Harold revealed that what they really wanted was a programmer to code the Hille Modulated Receptor model so that they could estimate rate constants. Being an engineer of very little brain, I looked at the paper and could not understand it (either the Hille original model nor the Hondeghem-Katzung variant). The problem was that the model as described by Hondeghem and Katzung seemed over-determined - like fitting a unique straight line through a single point. This was because Hondeghem proposed a shift in the "h" curve for inactivation of drug-complexed channels, and such a shift cannot be "identified" because it cannot be separated from a shift caused by voltage dependent blocking. Thus the MRH was initially not very interesting. Because of the ambiguity introduced in the MRH with shifted inactivation in drug-complexed channels, I made a counter proposal: lets simply use ordinary ligand-receptor binding kinetics applied to a linear reaction sequence (in contrast to a loop or cyclic reaction sequence) and see how many observations we can account for. It turned out that by ignoring the altered gating in drug-complexed channels, it was possible to account for, with quantitative accuracy, use-dependent profiles, frequency-dependent profiles as well as shifted channel availability curves for all data that I was able to get my hands on (both published and unpublished). Thus, the birth of the guarded receptor model - which in reality was an extension of Clay Armstrongs linear model of TEA block of K channels. Our contribution was to derive equations that permitted almost trivial estimation of the rate constants. Further, Jay Yeh agreed to test the model and estimation procedure with QX222 during one of his Wood's Hole summers - and then Stan Nattel's group verified it and of course, a number of fellows in our lab (Rosey Gilliam, Doug Packer, David Wendt, Mike Barber, Yuri Zilberter, et al) also verified it. Here, I'll bring together the story of the guarded receptor model and demonstrate how it facilitated identification of the proarrhythmic effect of all Na channel blockers. Bertil Hille and his graduate students, primarily Gary Strichartz and Ken Courtney developed an elegant model to provide an explanation for use- and frequency-dependent ion channel blockade. The interesting feature of blockade of many ion channels is that the fraction of drug-complexed channels depends on the frequency of stimulation. Thus there is some suggestion that the binding site is not continuously accessible as with traditional ligand-receptor binding models - e.g. antagonist binding to beta receptors. After Ken presented the Seattle groups ideas at UCSF, Luc Hondeghem and Bert Katzung immediately developed a variant for cardiac cells and began to explore the properties of antiarrhythmic drugs. The model is as shown here - with binding to each of the three dominant channel conformation: rest, activated and inactivated. The model is rather complex from a parameter estimation point of view in that there are 6 rate constants for drug-channel interactions as well as 4 channel transition rates for drug-complexed channels - 10 parameters must be estimated for application to a drug that blocks all three conformations. Looking at this with a little more detail, at equilibrium b(h)R = a(h)I. So I = b(h)/a(h) R. Similarly, k(I)[D]I = l(I)I* . Hille defines the equilibrium dissociation constant (see above) as including the concentration, i.e. Ki = l/k[D] where l is the unbinding rate and k is the binding rate so we can write I* = I/Ki. Continuing around the loop, R* = a(h*)/b(h*) I* and finally, R = Kr R*. Writing the conservation of mass: R = b(h)/a(h) * 1/Ki * a(h*)/b(h*) * Kr * R. Consequently b(h)*a(h*)*Kr = a(h)*Ki*b(h*). What is the challenge of this approach? Its that an exact modification of a numerator rate must be precisely balanced by a change in a denominator rate. This has been referred to as an allosteric effect by Jeff Balser. I initially thought that such a model could not produce use-dependent blockade, since once equilibrium is achieved, channels simply shuttle back an forth between drug-free states or drug-complexed states - but not between drug-free and drug-complexed states (because the driving force of the drug-binding reaction is always in equilibrium. 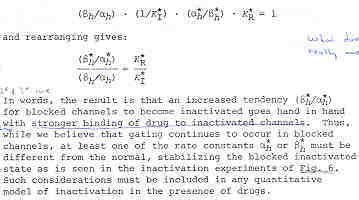 Hille suggested that this could be satisfied by requiring modified inactivation kinetics. Hondeghem/Katzung then proposed that there was simply a voltage shift in the gating kinetics, thus preserving the mass balance. This is incorrect, because a simple shift in the rates does not preserve the ratio of the rates, as required by a detailed balance. Moreover, such a shift cannot be measured experimentally (at least with electrophysiologic measurements) because blocked channels do not conduct and thus inactivation of drug-blocked channels cannot be detected. Some interesting observations: Pulse train stimulation with a 50 ms depolarizing pulse (-20 mV) and 200 ms recovery at -80 mV. The green trace is the fraction of blocked inactivated channels (I*). Note that at the beginning of each stimulus pulse (at 0, 250, 500, 750 etc) there is a jump in I* which reflects that rapid transition from R* to I*. This is followed by an exponential block for the 50 ms clamp interval. And then there is a 200 ms interval of slow recovery. During "recovery" there is an exponential increase in R* (shuttled from I*) which represents the slower time constant of state transitions for drug-complexed channels. Blue is the fraction of unblocked channels in the rest state and red, the fraction of inactivated channels. Lots of interesting speculation with this figure. To my knowledge, its the first demonstration of use-dependent block using a loop model that satisfies conservation of mass (detailed microscopic balance). If one looks carefully at the blocking pattern at the time the membrane potential is switched, its possible to see that under some conditions, blockade continues to increase. Here is a figure that show use-dependent block from a cyclic process (10 pulses of 50 msec duration, 200 msec recovery interval; Vrest = -80 mV, Vtest = -20 mV) followed by a long recovery interval at -80 mv. Its clear from the above, that as the binding affinity for rest channels is reduced, one can consider the "loop" reaction as a "linear" reaction, which is the foundation of the guarded receptor paradigm. This alternative approach is simpler and leads to a quantitatively accurate estimation procedure that produces unique parameter estimates. Lets assume that there is no "rest" block - thus the loop is broken and the blocking process is linear - and that all binding occurs with the inactivated channels where access to the binding site is determined by the channel conformation. Under these conditions, there is no loop and so there is no mass balance reqirement. But much more important, we can test the following hypothesis: can we account for the shift in channel availability seen in the presence of inactivated channel blockers simply on the basis of guarded access? The analysis below demonstrates both theoretically and the theory has been verified experimentally that the observed shift can be completely accounted for by guarded access. Because the guarded receptor model has fewer parameters, and (as shown below) leads to a unique parameter estimation procedure, it would seem to be the model of choice. Recently, Jeff Balser and his colleagues at Vanderbilt and Johns Hopkins articulated a model of ion channel blockade, which they called an allosteric model ( Kambouris NG, Nuss HB, Johns DC, Marban E, Tomaselli GF, Balser JR. A revised view of cardiac sodium channel "blockade" in the long-QT syndrome, J Clin Invest. 2000 Apr;105(8):1133-40). While the verbal articulation differs from that of the modulated receptor model, it is qualitatively similar, and indeed, suffers from the same problems of parameter estimation and viability with respect to the microscopic balance. To date (7.1.2000), these investigators have not reported demonstrations of use-dependence using their allosteric model. 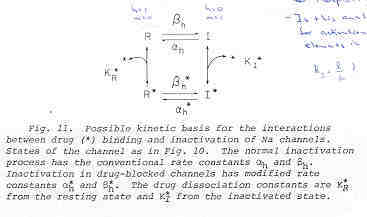 I thought that the above analysis made use- and frequency- dependence of ion channel blockade as described by their allosteric model impossible. I was wrong!!! I thought that with pulse train stimulation, use-dependent block would occur until an equilibrium was reached. At that point, no further use-dependence can be demonstrated because the transition processes for both the drug-complexed and drug-free channels are in equilibrium. The failure of this analysis was my assumption that the time constants of state transitions between drug-free and drug-complexed channels would be comparable. By making the state transitions between drug-complexed channels slow, use-dependence is always possible (discovered on the beach at Kolumvari, Crete - late one afternoon when the water was unsuitable for snorkeling). My first impression with the Hille model and the Hondeghem-Katzung extension was - well thats nice. The physics is correct, the chemistry looks reasonable - but something does not quite fit. The basis of the uncertainty is shown here: Control (drug free) availability and channel availability in the presence of drug - is this the result of simple voltage dependence of blockade or a combination of events including voltage dependent blockade and modified inactivation kinetics in drug-complexed channels? My concern was that the detailed balance, as shown above, mandated exact changes in the gating kinetics, but how could a simple theoretical construct dictate structural changes to the drug-channel complex?? Moreover, how could such a model be validated? The only possibility of validating it was with gating charge studies - but these are extremely difficult to implement and more difficult to quantitatively interpret. where s is the slope of the Boltzmann function: Avail = 1/(1 + exp(V-Vh)/s) and k and l are the rates of binding and unbinding from the channel substrate, and [D] is the drug concentration. This equation can then be fit to availability curves measured in the presence of drug and used to make least squares estimates of the binding affinity since the voltage shift depends on both the binding affinity as well as the drug concentration. Interesting experimental protocols are suggested by these equations. By measuring the time course of incorporation of drug into a channel, one can estimate k and l, then using the above equation, one can predict the shift in availability. Such a test would severely test the guarded receptor paradigm since rate constants from one protocol would be used to predict availability shifts based on the same model. If different processes were operating, the results would not agree. With studies of lidocaine, the agreement between observed and predicted shift was within 5% (See Rosie Gilliam's paper). For drug-free conditions, Vh = -103.4 mV and s = 4.74, while for 76 uM lidocaine, Vh = -112.8 mV and s = 6.17. For 15 experiments, the control Vh = -102.4 mV and s = 6.27 while for 76 uM lidocaine, Vh = -112.8 mV and kh = 6.17. Using the shift equation above, a 12 .4 mV shift corresponds to an equilibrium dissociation constant, Kd = 13.1 uM. We also estimated the rates of binding and unbinding from the results of pulse-train stimulation at frequencies. Analysis of the data revealed an open-channel binding rate of 1.36 x 10**6 /M/s and unbinding rate of 39.6 /s. 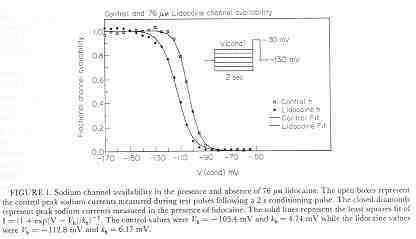 Binding to inactivated channels was characterized by a binding rate of 3.59 x 10**4 /M/s and an unbinding rate of .666/sec. The Kd (l/k) for inactivated channel binding is .666/3.59 * 10**4 = 18.5 uM, in good agreement with the Kd estimated from the midpoint shift in availability curves. The demonstration that the midpoint shift in availability can be accounted for by simple block of inactivated channels, WITHOUT requiring altered gating kinetics for drug-complexed channels is perhaps the strongest statement against the modulated receptor model. As far as I know, this is the only demonstration that clearly distinguishes the behavior of the Modulated Receptor paradigm from the Guarded Receptor paradigm. As pointed out above, though, the MRH parameters cannot be uniquely estimated - so that it is perhaps useful to conceptualize a process, but quantative studies are simply not possible. 1) Use-dependent and Frequency-dependent blockade requires an asymmetry of rate constants that shift the equilibrium toward and away from the Blocked state with changes in the membrane potential. �Without this asymmetry, an equilibrium would be achieved after some time that would not vary with additional changes in transmembrane potential. 2) Blocking channels will increase shift more rest channels into the Inactivated state due to simple mass action.� Consequently, at the rest potential where h is near 1, there can be significant �tonic� block, simply due to block of channels that are inactivated at the rest potential. 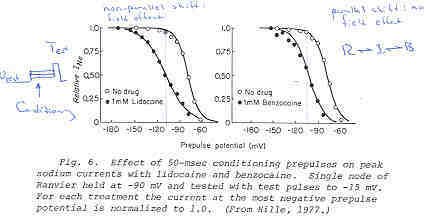 A early test of the guarded receptor paradigm consisted of simply testing the above simplified model by estimating the equilibrium dissociation constant with two different stimulation protocols, the inactivation protocol and a pulse-trains applied at different stimulation frequencies. In order to grasp the underlying simplicity of the above approach, I derive the main relationships for blockade of a periodically accessible (guarded) binding site.� I start by reviewing binding to a continuously accessible site and then extending it to a periodically accessible binding site. From this, its obvious that the membrane current just prior to stimulus transitions of a periodic piecewise exponential process follow an exponential sequence with a rate that is the linear function of the state-dependent rates and a steady-state that is a linear function of the state-dependent equilibria.� These results, in fact, suggest experimental protocols for testing this model �e.g. 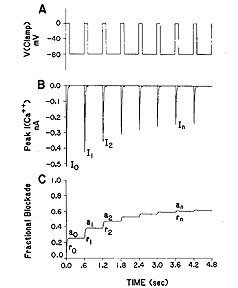 pulse train stimulation at different frequencies should yield a linear relationship between l and tr and another linear relationship between steady-state block and g.� Rosey Gilliam verified this with studies of lidocaine block of cardiac sodium channels and Jay Yeh verified it with studies of QX222 block of squid Na channels.� Here is a typical set of lidocaine blockade data demonstrating the frequency dependent effect:� the higher the frequency of stimulation, the greater the blockade (from Rosey Gilliam�s work). From these plots, the apparent rates of binding and unbinding can be estimated:� la = ka[D] + la,� lr = kr[D] + lr;� a� = ka[D]/( ka[D] + la) , r� = kr[D]/( kr[D] + lr).� For this example,� we can assume a mean open time of 1 ms (ta) so that la = 714.9/s and lr = .102/s .� ka[D] = a� * la = .6873 * 714.9 =� 491.3.�� Assuming [D] = 2 mM, then k = 2.45 x 105 /M/s and l = la - ka[D] = 714.9 � 491.3� =� 223.6 /s . where g is a general �guard� function that describes the fraction of accessible channels and t is a general �trap� function that describes the fraction of blocked channels where the drug is trapped and cannot escape.� This scheme is readily described by .� In the case of block of inactivated channels, g = (1-h);� for open channel block, g = m3h, assuming the Hodgkin-Huxley channel formalism. 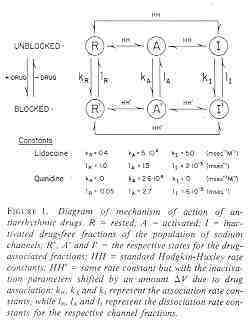 To incorporate the drug model into a standard description of an excitable membrane (HH, Lou-Rudy, Beeler-Reuter),� its only necessary to add the blockade differential equation and modify the conductance of the channel being blocked.� For the standard HH Na model, we write gNa = gbarNa*m3h(1-b) where gbarNa is the maximum Na conductance. Look at results of exploring the cardiac vulnerable period at /sample.html for results from studies exploring the basic nature of propagation in an excitable medium and at : /vp.html for insights into drug effects on cardiac conduction and cardiac arrhythmias.